When using sunscreen you are bound to get some on your clothing and the stains can be difficult to remove, especially from white clothing. This page has advice about removing sunscreen stains from whites as well as darker clothing. Having freckly/fair skin I need to wear sunscreen every day. Some brands can leave a yellow/brown stain on light clothes. To remove this stain: moisten the area, rub with plenty of dishwashing liquid (I use a popular clear green type), and scrub with a nail brush if the fabric can take it. Then soak overnight and wash as usual. I've come across this tip only once, and it works so well it bears repeating. Thanks for the great tip. I have just changed to a Coppertone kids product and it wasn't until I did a white wash that I found 4 of my daughters white tops essentially ruined by yellow stains. I followed your tip with regular dishwashing liquid with an old toothbrush and this morning 2 are back to normal and the other 2 are much improved. Thanks heaps, you've saved me from throwing them all away! Sunscreen seems to be staining my t-shirts around the neck and also the tops of ankle socks. I've tried pre-cleaners and bleach and still no luck. I have had the same orange problem for several years. Recently I did my own experiment with sunscreens we have at home. As many others noticed any with avobenzone left dark orange stains. However Walgreen's Baby Sunscreen stick, Neutrogena Pure and Free Baby, and Coppertone Sensitive Skin left no stains even after washing. 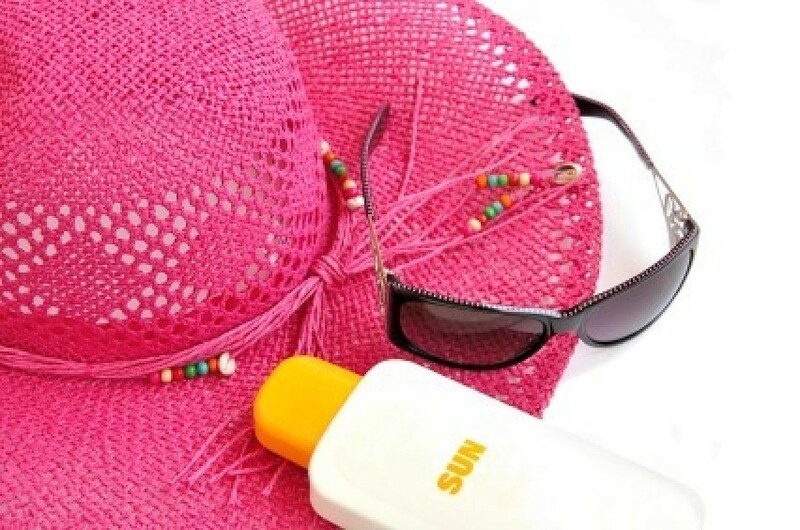 Their active ingredients are tianium dioxide or zinc oxide instead of chemical sunscreens. They do go on thicker and slightly white, but I think it's better than ruining all my clothes. I think our hard water is part of the problem. I also think that clothes that have been washed in hard water will hold a small amount of that rust in the fabric because there was almost immediately an orange discoloration on the old white cotton sock I used for my experiment, the stains became darker after washing. 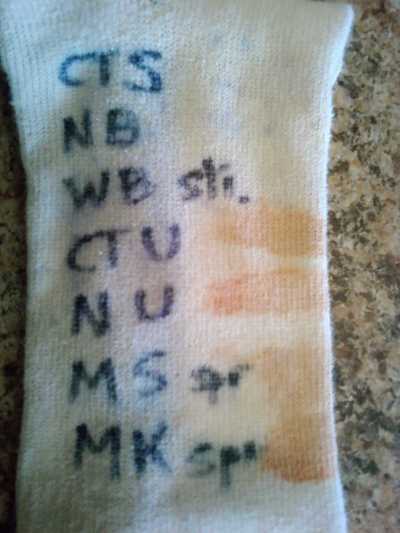 I have attached a photo of the sock I used in my experiment. Below is the meaning of the letters on the sock. I read many of the recommendations and tried "The Works" toilet bowl cleaner because I didn't have any of the bathroom cleaner. It worked instantly, no scrubbing needed! The stains just disappeared, even old stains that had been washed and dried multiple times. I went out and bought "The Works" bathroom cleaner and it worked just as well. I am so relieved. Don't try anything else, just go out and get "The Works" because it works! After reading all the comments about chemical reactions I decided to do a little experimenting myself. I found that The Works tub & shower cleaner takes out the stain. I spray it on wet or dry clothes, rub it gently and walk away for 5 minutes. When I returned the stain was gone. It's very inexpensive (under $2) and can be purchased at Walmart or Kmart. It works great on rust stains in toilets & tubs too! Their website is theworkscleans.com and you can enter your zip to find a store near you. How do I get stains from sunscreen out of my clothes? It also left stains on my enamel on steel bathtub. First make sure the clothing is dry. Then take baking soda and sprinkle over the stain to absorb any excess oil. You will want to let it sit for about 30 minutes. Next dust off any remaining baking soda and take some liquid dish soap and rub into the stain, let it sit for about 5 minutes. Now you will need to mix 1 teaspoon of laundry detergent into a bowl of hot water and allow garment to soak in this mixture for about an hour. Rinse with hot water then launder as usual. I would like to credit Michelle Manetti from StylelistHomewriter for sharing these instructions. How can I get the orange stains from sunscreen out of white clothes? I cannot find Biz bleach, which was recommended for an enzyme pre-soak. I also tired The Works but the stains reappeared as soon as I washed the clothing. Bar Keepers Friend: Thanks for the tip! I had given up on my new white blouse badly stained from SPF cream, but I followed the instructions provided on this site and I can wear the blouse again! Many thanks to all who alerted me to this product which I had in my kitchen. It also removes stains from bathroom sinks, rust stains in the toilet basin and of course, shines the stainless steel sink to look like new. You all saved me a great deal of money! I have recently returned from my holiday with white cotton clothing that is no longer white. The yellow color my whites have turned is thought to be sunscreen, but I'm not 100% positive. Does anyone have any suggestions that will help me? I have a number of white cotton t-shirts that have orange and red stains around the sleeves and neck from what I could only imagine is sunscreen. These stains magically "appear" when I wash them. I use ALL Free detergent, borax, and vinegar in each wash. Anyone have any ideas on how to get these stains out? I have the same problem. I use Bar Keepers Friend and have good results. It's a cleaner similar to Comet or Bon Ami. I usually wet the stained shirt, sprinkle with Bar Keepers Friend, work it in (sometimes scrubbing with a brush) and let it sit a few minutes, then wash it out in the sink. It works like magic! Warning: Be sure not to mix it with detergents or bleach. I live in Oregon and use well water. Our water has a lot of iron/rust in it. I haven't noticed this before and wonder if it's due to some ingredient in the new sunscreen I've been using. It's Neutrogena Ultra Sheer Dry-Touch 45 SPF. We have the same problem. Use "Whink" in the brown bottle and the stains will come right out with no scrubbing! I just wanted everyone to know that I spoke to a lady at Coppertone, and she advised me that there can be a chemical type reaction between the sunscreen ingredient avobenzone (also known as Parsol 1789) and the minerals in the well water. I'm now trying a chemical free brand called Blue Lizard, and so far the "sensitive" formula has NOT caused any stains! Since it's chemical free, it is more expensive and harder to find but may be a solution for others! I don't have well water (our water is soft) and had the same problem this summer, especially on the t-shirts my son wore when he played tennis. He used Neutrogena Ultra Sheer dry-touch sunblock SPF 55. For years I have used Biz stain activated booster powder (about 1/2 cup mixed in with half a dish container of water) to soak stained clothing overnight and it seemed to work pretty well on these stains as well. I always scrub the affected areas and try to make sure the stain is out before washing. I, too, had yellow stains on a white shirt at the elbows and collar following use with Coppertone waterproof Baby sunscreen 50 and a hot day. The shirt came out of a cold water wash with Tide liquid, and there were the stains. i first soaked it in hot water and OxyClean with no improvement. Reading here I tried Whink Wash Away applied liberally on the sleeves and collar, and then left it to soak overnight in cold water. This morning the stains are gone! I support the Whink Wash Away, which I don't think I have ever used before, but was in my laundry cupboard.